An excerpt from Dave's PPG book - A few useful tip regarding propeller repairs. I usually open these cracks up, using a sharp object such as a screw driver or chisel. By opening up I mean removing small amounts of wood along the crack on both sides of the blade if the crack is visible on both faces. This allows a furrow for the repair material to bond into. For small repairs such as this, I usually force epoxy in with a finger, smoothing the excess off with a cloth or a mixture of water and soap. This is easier if the epoxy is water based. If I am using resin and the crack is open all the way through, I place a layer of tape over the crack on one of the sides. This will prevent the resin from running out the other side. Smaller, finer cracks and splits in the directions of the laminations may be repaired with super glue of the Cyano-Acrylate constituent. This is one of the strongest glues I am aware of and one of the few that will bond rubber. As mentioned both epoxy and super glue may be mixed with baking soda to increase strength and setting time. 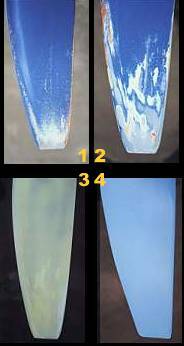 Larger gouges Usually undertaken with resin or epoxy, however here the epoxy or even Pratleys steel epoxy or putty may be mixed with small grained saw dust . The damaged area is cleaned, any cracks opened slightly and the mixture is forced into the area. It is essential that the material used enters the crack and makes contact with both sides of the gouge, hence use a finger or sharp object. SOON - A CD that details STEP BY STEP how to make your own prop from scratch. Probably the most common prop damage This usually needs rebuilding and shaping afterwards. 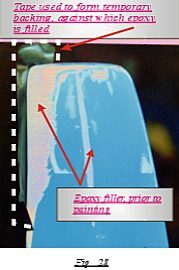 If the material is soft and does not retain the shape required, simply add a backing plate as described with tape, and apply the repair material to the area using the tape as a guide to work against. A number of applications may be required with small air bubbles, indentations etc being refilled. As the material dries it is further possible to sometimes mould it further into the desired shape. Large chunks missing Hopefully at this stage of damage the rest of your unit is still flyable (if not refer to Frame repairs). Mostly this may be repaired using one or more of the above methods, however sometimes wood must be added or spliced into the existing prop. Afterwards grind down all excess material then use sand paper proceeding to fine as a final finish. Usually these are not repaired until the blade is worn well away. It is howeveraesthetically pleasing to have a good looking propeller that is in good condition.Sand blasting occurs when warming up of the engine is undertaken on loose sand and gravel. The sand is sucked through by the prop and simultaneously eats away the prop on it`s way through . Repairs are undertaken by lightly sanding the uneven areas, ending with around 210 grain. (IF USING WATER PAPER LET THE WOOD DRY FIRST BEFORE PAINTING) . Painting may be undertaken with either the aerosol type paintsor progressing up to 2k properties. A primer may have to be used prior to painting. Small Chips and Medium Holes. Here two main options are available . 1. Laminating in another suitable piece of wood. This is cut to fit the piece missing and glued in place with a suitable wood glue or resin or epoxy. Heavy woods usually make re-balancing difficult. The gaps are then filled as already described. 2. I usually place a backing tape around the area that is missing. This is then filled with resin or epoxy or similar material. The area once dry is sanded and refilled using one's finger to force material into all the air bubbles and uneven areas. Once again sand ending with fine grained paper. Trim the edges to the same diameter as the opposite side. In order to attain the same dimensions as the other side, place a piece of paper over the opposite edge and draw a template and cut it out. Transport this to the mended side and draw around the template. Sand the excess material away until the size is exactly the same as the opposite. Collect your free prop balancer plans under "Freebies"